Emma at ASAMUM BOOKTOPIA was originally going to host an event for Valentine's Day and she sent me an email asking if I would like to write a post about love or romantic moments or favourite couples. The idea of writing a list of favourite couples from TV made me really excited and this was meant to be the post that I'd written for her event but on my blog. That afternoon, going for my run, TV couples just kept popping into my head and I'd remember a little bit about why I loved them so much, it was a lot of fun reminiscing. Of course I didn't have any means of writing them down, and promptly forgot about the majority of them. Fast forward a week or so and I was telling N in the car about this idea for a blog post. I asked him if HE was writing a list, who would be on list of favourite TV couples? Me: Who the hell are George and Mildred? N: (gives me a look) Google them. N: Ooh, ooh! HOMER AND MARGE! 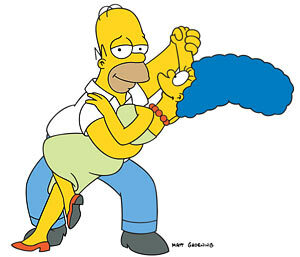 Me: Ohmygod, Homer and Marge! That's a really good one. N: I KNOW! I'm really good at this game. He did actually have some great suggestions and helped me a lot with the following list. 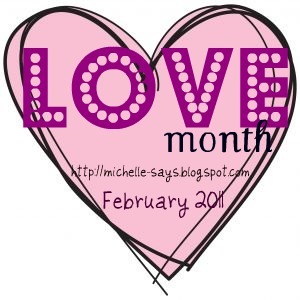 Even though I'm not including most of his couples from '70s TV. (N's older than me!) Also, I couldn't find a good picture of Frank and Betty from Some Mothers Do 'Ave 'Em. Ross and Rachel from Friends - These two were the first couple I thought of. I love Ross and Rachel together. All my favourite scenes or quotes from the show usually involve the two of them. I love how they got together and broke up and got together and broke up. They had a very complicated and ongoing relationship and I wanted to witness every bit of it. My heart ached for these two. From that first romantic kiss in the cafe, to Ross saying 'I take Rachel' at his wedding, to WE WERE ON A BREAK to being 'never off the table' - I think Ross and Rachel deserve their position at number one on my list. Jin and Sun from LOST - Lost, now there's a TV programme chock full of romance. N suggested Kate and Jack originally, but changed his mind once I'd said 'Jin and Sun.' I could have picked Charlie and Claire, or Sawyer and Juliet, or Penny and Desmond. There was so much romance going on on that desert island, it was fantastic. But something about Jin and Sun just did it for me. Their marriage was really failing at the beginning of the show, and as it went on we could see how much of a disaster it had really been: with Jin being so controlling that Sun had an affair... and then they really turned things around. Jin worked so hard to win Sun back. And then just as they were falling in love with each other all over again, they get separated and separated and then that ending. I cried absolute bucket loads. In fact, I'm tearing up now just thinking about it. Oh, Jin and Sun. Willow and Tara from Buffy the Vampire Slayer - Oh my god! How much did I love Willow and Tara as a couple? I've always been a HUGE fan of Buffy the Vampire Slayer, and I was really, really sad when Oz left the show. In fact, I was bereft. Oz and Willow were adorable together and I didn't think anyone could replace him. And then we're introduced to Tara, beautiful and stuttering, magical Tara! Oz who? I think the feelings between Willow and Tara are so tangible as a watcher, instantly believeable. I thought they had great chemistry together and ohmygod, how HOT are they as a couple? The scene where Tara sings for Willow in Once More With Feeling? Steamy. Haley and Nathan from One Tree Hill - I adore Nathan and Haley. I love how very different they are to each other and despite all of the hardships they've gone through - Haley leaving on tour, very early marriage and pregnancy, they're still together. And still cute together. There's been so much character development with Nathan. He starts out as a bit of a douche only hanging out with Haley to make Lucas mad, and then they end up being this great and romantic couple. I'm relieved and ecstatic that Nathan remains loyal to Haley, no cheating and no melodrama between the two of them. I like solid relationships like theirs. Pacey and Joey from Dawson's Creek - Will I lose all my credibility with this last choice? I don't care! I was just the right age when Dawson's Creek came on air. There were those who couldn't stand the show or the characters, who found it all to be too much. But everything about the show appealed to me, both then and now. When Joey and Pacey started getting involved, I instantly loved them. I was always put off by the label of 'soul mates' between Joey and Dawson and was rooting for Joey and Pacey all the way to the end. I thought they were quite sweet together and my overwhelming crush on Joshua Jackson didn't hurt one little bit. With honourable mentions which go to Mulder and Scully from The X Files and Brennan and Booth from Bones - both shows that carried on the will-they/won't-they? to the very extremes. Who would make your list of favourite romantic couples from TV? Ooo, great list! I like the Tara/Willow choice, they were adorable together, and Under Your Spell is a wonderful song! I also like Bones/Booth, though there is a bit too much self-deception there for my taste. However, when it really comes down to it, there is just one TV romance for me, Cory and Tapanga from Boy Meets World. That was my dream as a high schooler. Great list! I agree about Tara and Willow! Kenny - OHMYGOD! I can't believe I forgot to include Cory and Topanga!! Best couple ever. God, I loved that show. Luisa - You know, I never remember The Gilmore Girls when I think of my favourite shows, but it's definitely one of them. Maybe because I came so late to it? But oh yes, I did love Rory and Jess together! Ross and Rachel are the ultimate couple for me. Also Meridith and Derek from Greys's Anatomy. Is it sad that I know who George and Mildred are???? Leanna - I do too. I have a mad crush on Joshua Jackson though, so I don't know if that clouds my judgement or not! Vivienne - I never watched Grey's, so I have no idea who they are. 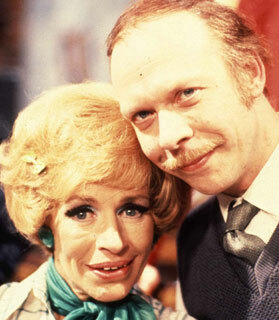 And no, it isn't sad that you know who George and Mildred are! I'm young, and American and therefore didn't grow up in England like you and N. He grew up with his parents watching these shows, whereas I have never heard of most of them! Jenny, I'm with you, I really like Seth Green, and I did love him as Oz. I just loved Tara more. She was just so cute and her transformation from awkward shy girl into confident woman was really great to watch. Doctor Who (David Tennant's Doctor) and Rose Tyler! Oh, if only he wasn't so much himself! And that scene with the two doctors! Oh my gosh, how I cried! Leonard and Penny from The Big Bang Theory. Simply because they just make me laugh SO much, and it was so sweet when Leonard was all happy when they were together. That's that category done. Now for normal couples... It's quite old, but I LOVED Ephram and Amy from Our New Life in Everwood. Gosh, fromt the first series to the last, their story was just.. wow, so much drama, but so beautiful! I loved it! You know, I think that's it. I don't think I watch too many things where there are story threads for romance that aren't either all over the place too much be a fave, or because there are just too many. They'll do for me! Ross and Rachel were the first ones to pop into my head. What a great couple! I never get tired of watching them. You picked all my favorites! But I would add Barney and Robin from How I Met Your Mother. Many of these shows I'm not familiar with! They look great though. I may have to do my own post on this one... too much fun! Love Willow and Tara! And so with you on the whole Oz thing! I was very unhappy when he left, but in walked Tara..
Ross and Rachel would be on my list, too. Whenever I think of them, I think of Phoebe's "He's her lobster" quote. I'm LOVING the response to this post! Fiona - Ooh, good luck on the blogging, it's been an incredible epxerience for me so I wish you the very best! Oh Jo, I love your comment, I really do. I just don't watch ANY of those programmes. I've at least heard of the sort of heartbreaking thing between the Doctor and Rose but I still don't fully understand. Linda - Ahhh, I don't watch that show so I have no idea who they are! I feel like I don't watch very much TV recently. Suey - Ooh, would love to see what you come up with. Becca - Yeah, it seems that's how many of us felt. Though I did really love Oz..
one of my fav TV couples is Penny and Leonard from The Big Bang Theory (they are just so cute) and if you've seen The West Wing any of those relationships are soooo sweet too! I said it to someone else, but I can never remember The Gilmore Girls when I think about my favourite television programmes, so it always gets left off. But I did think of Vaughn and Sydney, except it was so .. weird like you said. First two seasons of Alias? I would have totally put them on my list. Not so much afterwards..
Nice list. I had always wanted Joey and Dawson to end up together, but after recently rewatching the Joey~Pacey scenes, those two are a great couple. My list would include Jack and Martha (Home and Away), Lana and Clark (Smallville), Lois and Clark (The New Adventures of Superman), and perhaps my favorite couple ever Chuck and Sarah (Chuck).